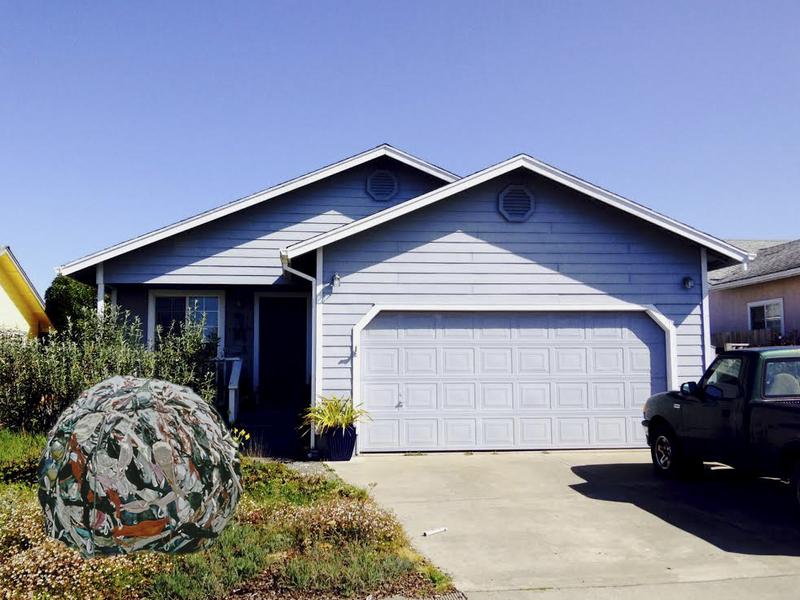 You know how it is—you have a Giant Bra Ball in your garage and don’t know what to do with it. You haven’t been able to park your car inside for years. It’s time to get serious about finding it another home. But where? 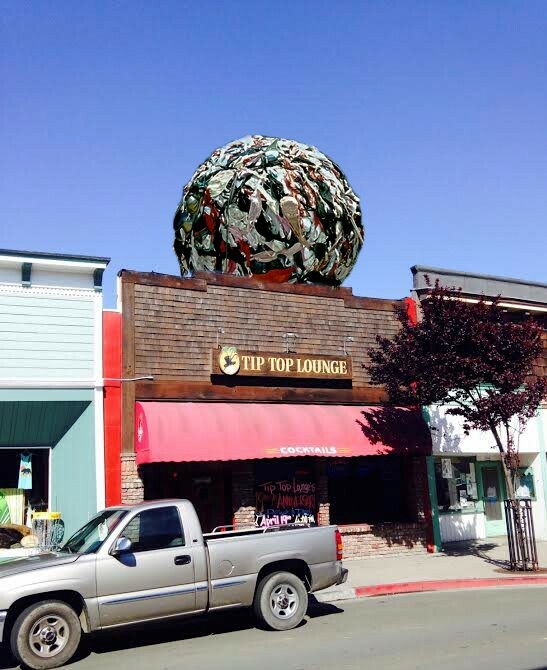 This particular Giant Bra Ball was made by San Francisco Bay artist Ron Nicolino in the late 1990’s. He intended it as a whimsical way to bring awareness to the serious issue of breast cancer. When it wasn’t displayed on a flatbed trailer parked outside of the Pier 23 Café in San Francisco, he hauled it behind his pink Cadillac up and down the California coast. In July 2001, it was featured in Mendocino’s Fourth of July parade. You might think such a ball is unique, but it isn’t. 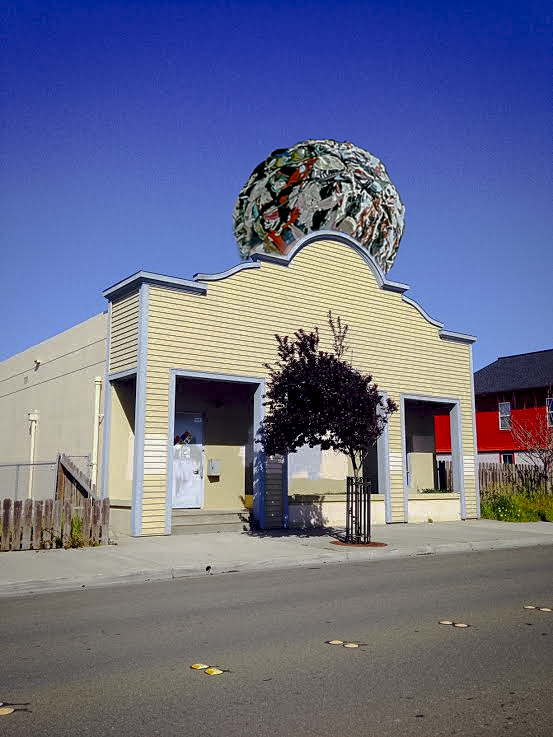 During this same period, another was constructed by San Francisco artist Emily Duffy, thus igniting the infamous Giant Bra Ball War. It all began after Nicolino was denied his vision of “Bras Across the Grand Canyon.” He searched the artistic community for anyone who might make use of his collection of donated bras. Duffy answered the call. They attempted to collaborate on an artistic piece, but were unable to agree about who should get credit for the original Giant Bra Ball idea. Nicolino ended up keeping his bras and started rolling them while Duffy sent out a plea for donated bras and began rolling her own. Except through their lawyers, they never spoke again. 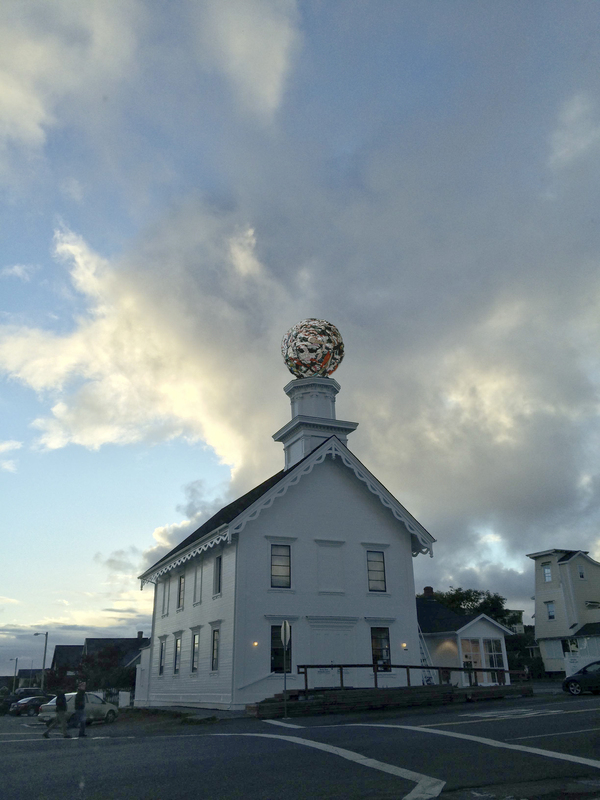 Duffy’s ball is part of the permanent collection at the American Visionary Art Museum in Baltimore, Maryland. But where is Nicolino’s? My July 2014 blog post “A Ballsy Idea” attempted to find the answer. A tickle ran up my spine. Through email exchanges, Ruby told me that Nicolino took the Giant Bra Ball with him when he moved to Washington State in 2002. After he passed away in 2009, it was transported to a secret location in California. If Nicolino’s Giant Bra Ball isn’t in your garage (it actually could be in mine—hiding behind a mountain of other stuff), I imagine it somewhere dark and lonely, checked on occasionally by family and friends. Wouldn’t it be great if it could once again see the light of day? Ruby would love to see it installed in an art gallery or institution for breast cancer awareness. She also suggested that it might be auctioned off on eBay with the proceeds going to charity. Ruby mentioned Burning Man and this got me thinking. Perhaps the organizers could plop the Giant Bra Ball down in the middle of the event. As they unroll it, they could distribute bras like party favors to people (who I understand are otherwise naked). At the very end, everyone would rip off their bras and toss them on top of a bonfire. Nicolino’s creation would go out in a blaze of glory. Why don’t we buy it? By “we,” I mean Fort Bragg or Mendocino. It’s just the type of quirky, yet socially relevant art that our community embraces. 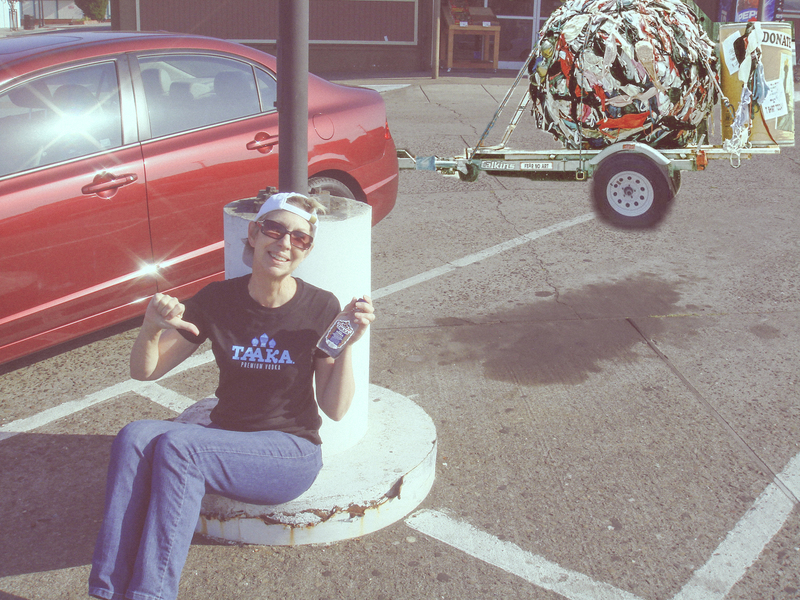 I visualize it attracting attention in a number of locations. Please let me know if you have any suggestions for this Giant Bra Ball. I really do want to start parking my car in the garage. It’s not often that two people get into a fight over a giant bra ball. In fact, my research suggests it’s happened only once in the history of mankind. The kerfuffle started in the mid-1990’s when San Francisco Bay Area artist Ron Nicolino began collecting bras for “Bras Across the Grand Canyon,” a performance art piece to condemn sexism. Alas, the feds would not approve the venture, and he was left with tens of thousands of bras that had been donated by women from all over the world. 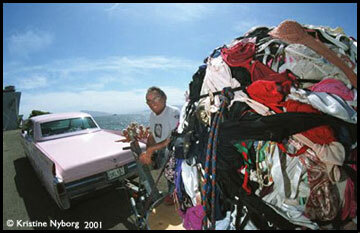 He took his plight to the San Francisco Chronicle, which published his desire to donate the bras to a worthy cause. Emily Duffy, another Bay Area artist, answered the call and offered to take a few hundred. 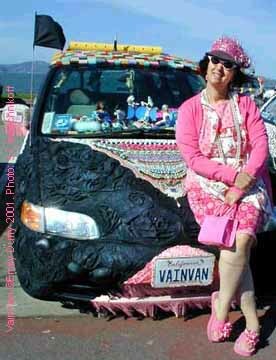 She would use them to make a car bra for her “Vain Van.” But Nicolino wasn’t interested in giving away just a few—he wanted to unload his entire inventory. I know what you’re thinking—right there should have been a sign that trouble was on the horizon. Later, Duffy claimed that during their initial phone conversation, it was her idea to create a Giant Bra Ball. Nicolino claimed the idea was his. After all, most of his bras were already wrapped around a giant spool. 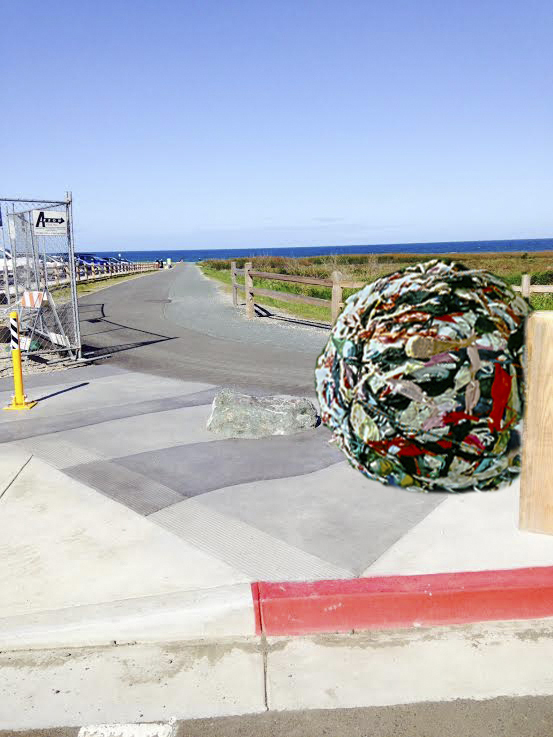 A spool is a ball-like form, right? Nicolino apparently didn’t get any warm fuzzies during his conversation with Duffy or from her subsequent letter where she proposed they collaborate on making a ball. He started rolling his bras toot-sweet. At the time, Duffy had only 10 bras. How could she possibly compete with his collection of 20-60,000? (The estimates vary widely.) I’m thinking—but do not know—that Nicolino grossly misjudged her tenacity. Within weeks, she emailed a bunch of friends and quickly procured 15,000 bras. The Giant Bra Ball War was on! They each retained a lawyer. From that moment on, they never referred to each other by name. Duffy called Nicolino “the other artist” and he called her “the individual.” Duffy’s lawyer sent a cease and desist letter. Nicolino’s lawyer fired back a claim that a copyright cannot be held on a concept of sculpture. 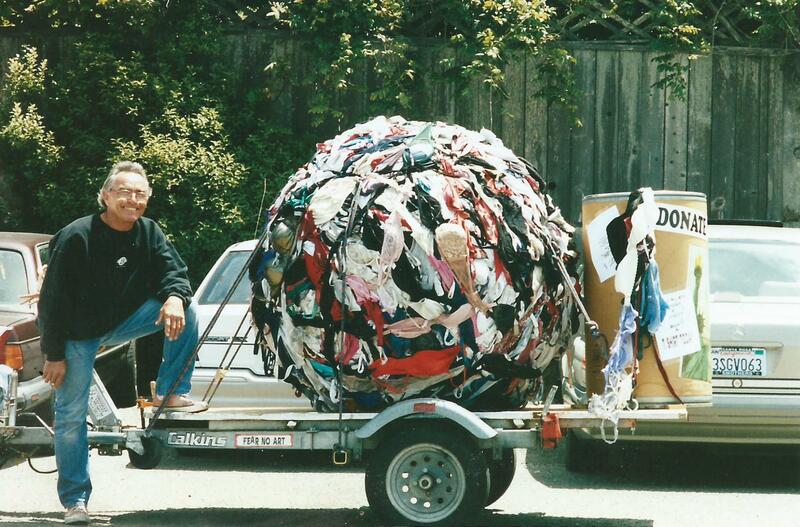 I don’t know about Emily Duffy, but I do know that Nicolino hauled his Giant Bra Ball to the Mendocino 4th of July Parade in 2001. At the time I was still adjusting—after nine years—to living on the Mendocino Coast and was shocked by the number of women who reached inside their shirts to unhinge their bras and toss them onto the back of the flatbed towed behind his 1963 pink Cadillac. I would later regret not having been brave enough to rip off my bra to donate to the 14,000 or so hooked together to form the five-foot diameter ball. For some years—although I am unable to determine how many—Nicolino towed his Giant Bra Ball in parades and parked it outside the Pier 23 Café in San Francisco. Nicolino died on July 7, 2009 at the age of 69, three weeks after being diagnosed with cancer. A few years previously, he’d moved to La Conner, Washington, and started a casket-making business. At the time of his death, he was working on his own casket, which featured a clown face. An artist friend finished it for him. 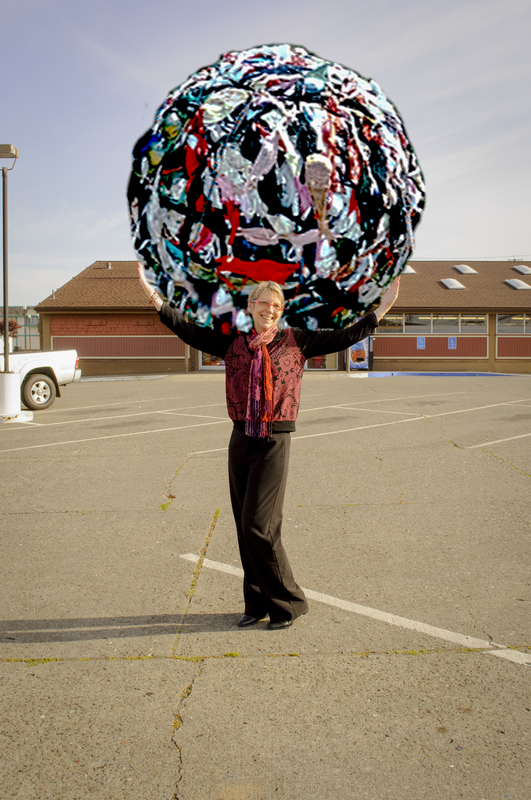 After he died, his mother hoped that some organization would take the 1,600-pound bra ball. Alas, in all my research and email inquiries to strangers, I am unable to find out what happened to Nicolino’s Giant Bra Ball. Duffy’s ended up in the American Visionary Art Museum in Baltimore, Maryland. It’s unclear whether Nicolino took his Giant Bra Ball with him to La Conner. Given his mother’s wish that someone take possession of it, I imagine the ball stayed—like my son’s international Starbucks mug collection—in her garage.